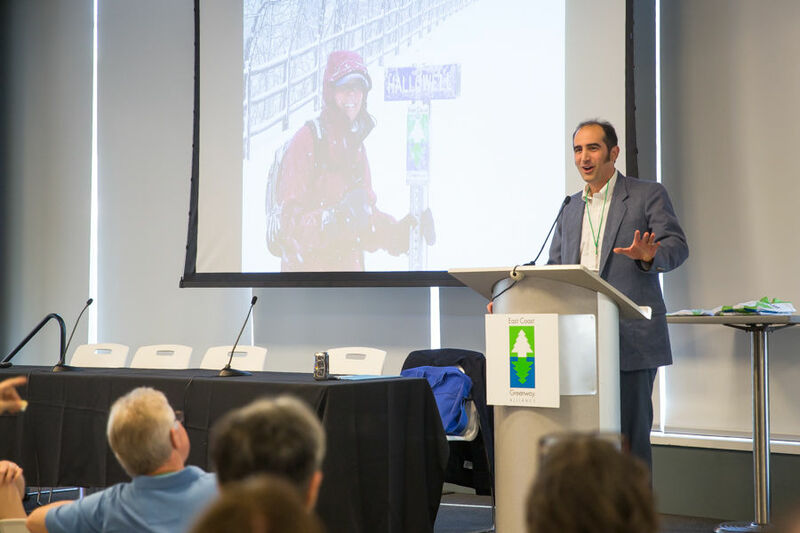 New York City Parks Commissioner Mitch Silver opens the day with his keynote address, "21st-Century Parks and Public Space: What's Next." 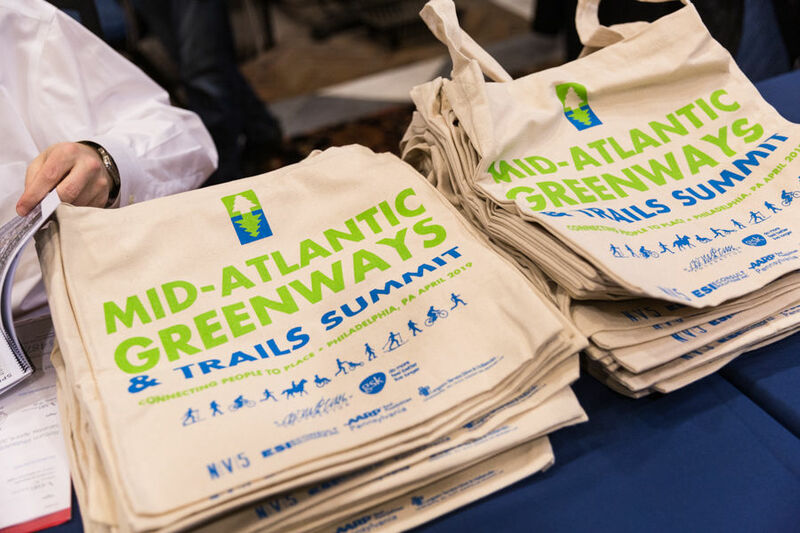 Three days of talking trails, learning from others' work, and deepening partnerships left attendees proclaiming our first-ever Mid-Atlantic Greenways & Trails Summit a success. 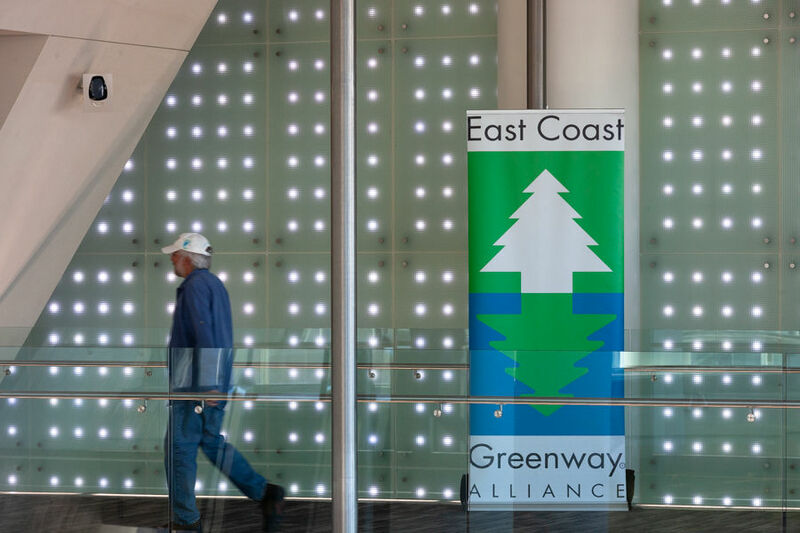 "Thank you, @ECGreenway & other presenters and organizers," tweeted attendee Tony Goodman as he made his way home to Washington, DC. "I'm ready & inspired to continue our work for more & better trails." Executive Director Dennis Markatos-Soriano presented bike jerseys to Taylor Kuyk-White, program manager of the Bicycle Coalition Youth Cycling Program, and Emir Johnson and Jahmiel Jackson, two members of the program's Youth Advisory Committee. 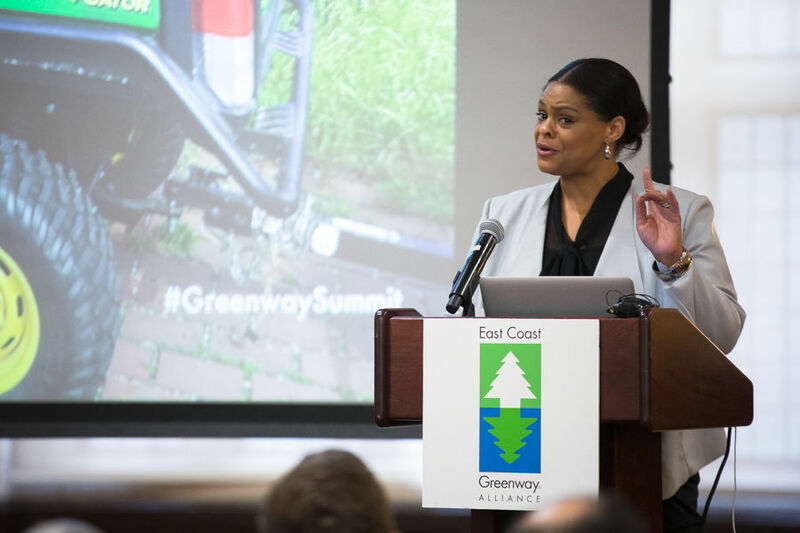 The Summit began Thursday, April 4 with afternoon mobile workshops followed by a reception and panel talk featuring leaders of the local Circuit Trail network, of which the East Coast Greenway offers a centerpiece route. Executive Director Dennis Markatos-Soriano greeted attendees, followed by Taylor Kuyk-White, youth cycling manager for Bicycle Coalition of Greater Philadephia, who welcomed the group to Philadelphia and introduced Emir Johnson and Jahmiel Jackson, two members of her Youth Advisory Committee, who shared stories of what cycling means to them. 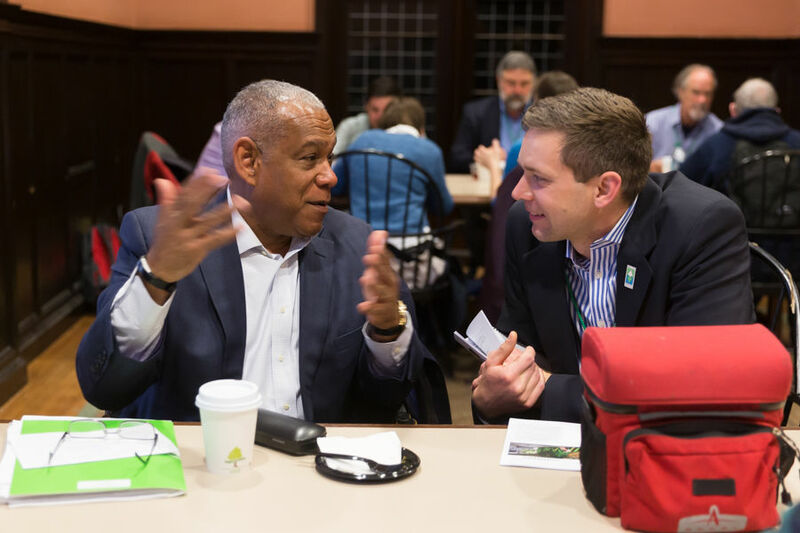 We began Friday with a keynote address by Mitchell Silver, commissioner of New York City's Parks Department. 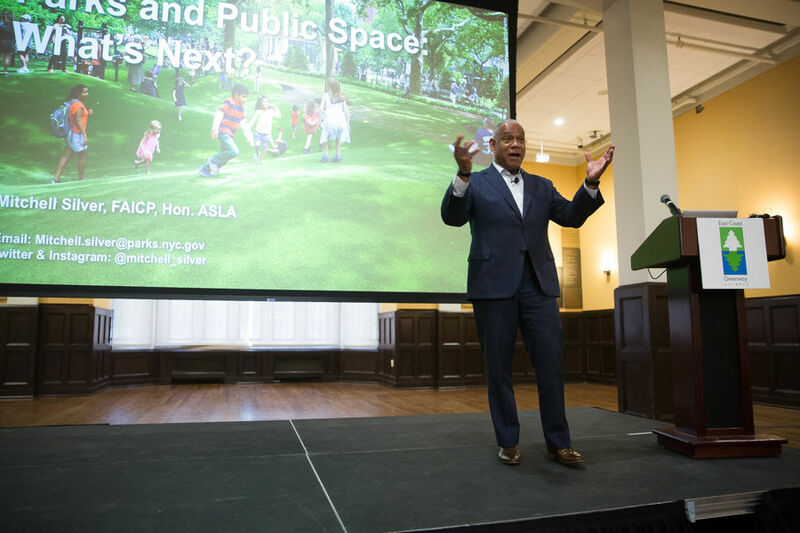 "You give me a sidewalk, I'll give you a park," Silver told attendees, a concept familiar to many linear park greenway designers in the audience. 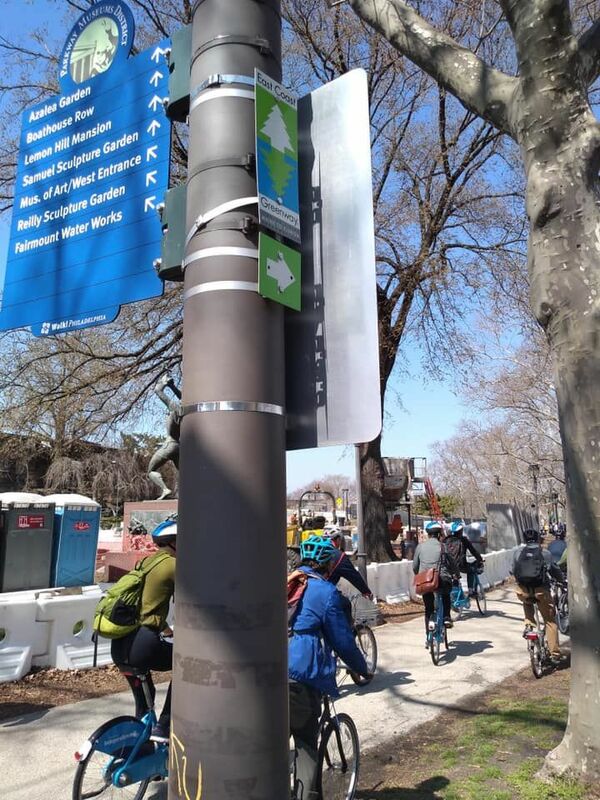 Silver's initiatives in creating "parks without borders" include taking a new look at park entrances, edges, and adjacent space, adding things such as sidewalk benches because parks close at dark. Four breakout sessions followed with more than 20 presentations. 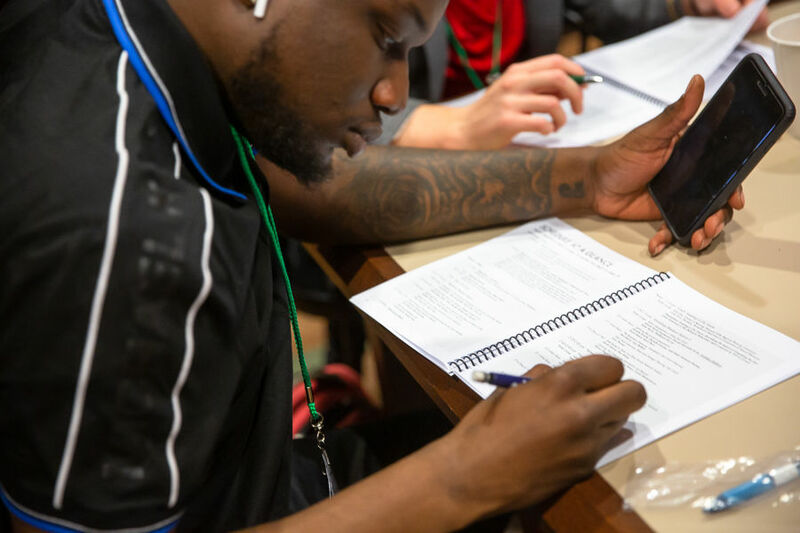 Strong themes running through the sessions were the value of collaboration and partnerships and the practice of equity, bringing diverse community voices to the table early in the planning process. 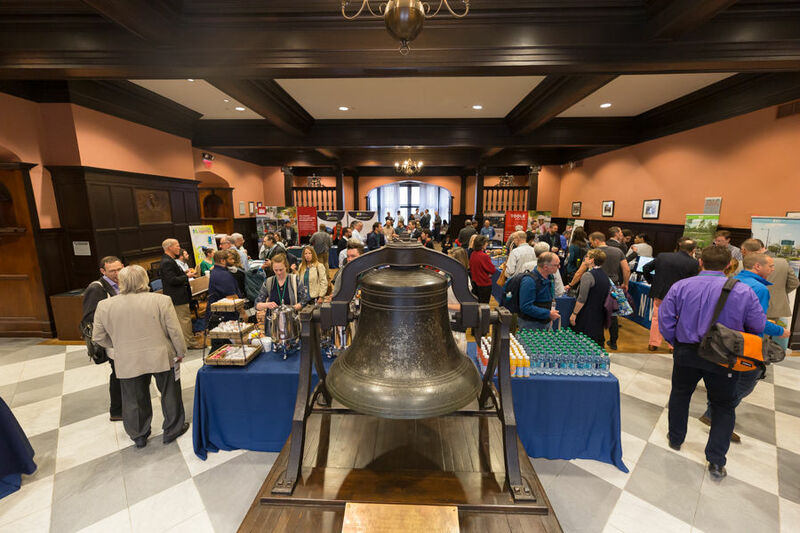 Breaks throughout the day allowed for networking and visiting with sponsors in our expo hall. 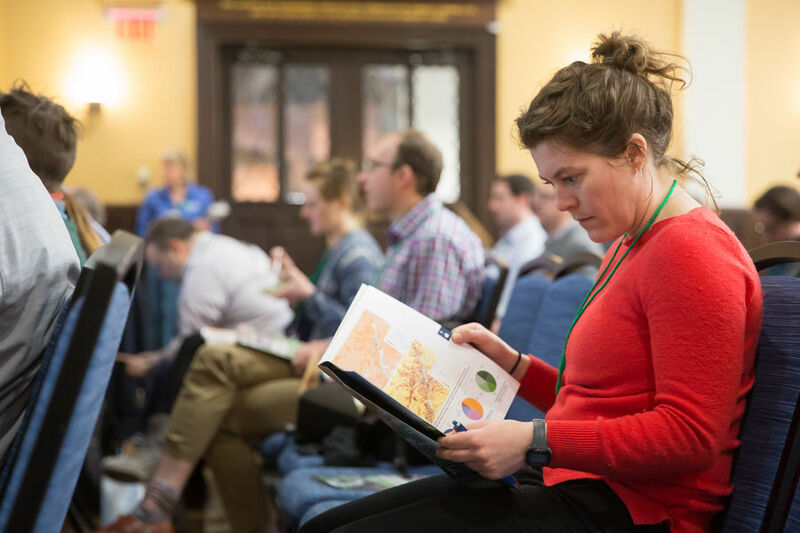 Patty Elkis, director of planning for Delaware Valley Regional Planning Commission, and Cindy Dunn, secretary of Pennsylvania's Department of Conservation & Natural Resources, also spoke at lunch, reinforcing the impact report's findings. 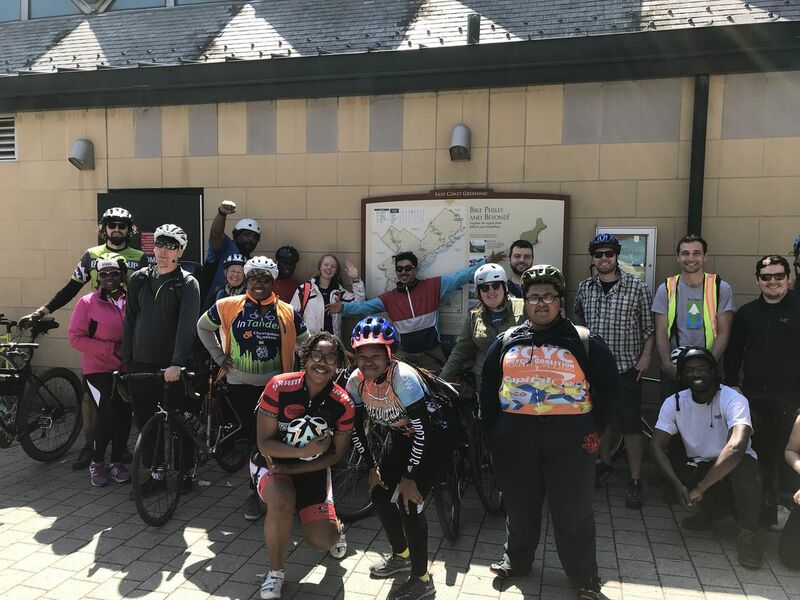 We wrapped up our time in Philadelphia on Saturday with five mobile workshop options, from a cleanup of Schuylkill River Trail to bike rides and a walk across the Ben Franklin Bridge from Camden. 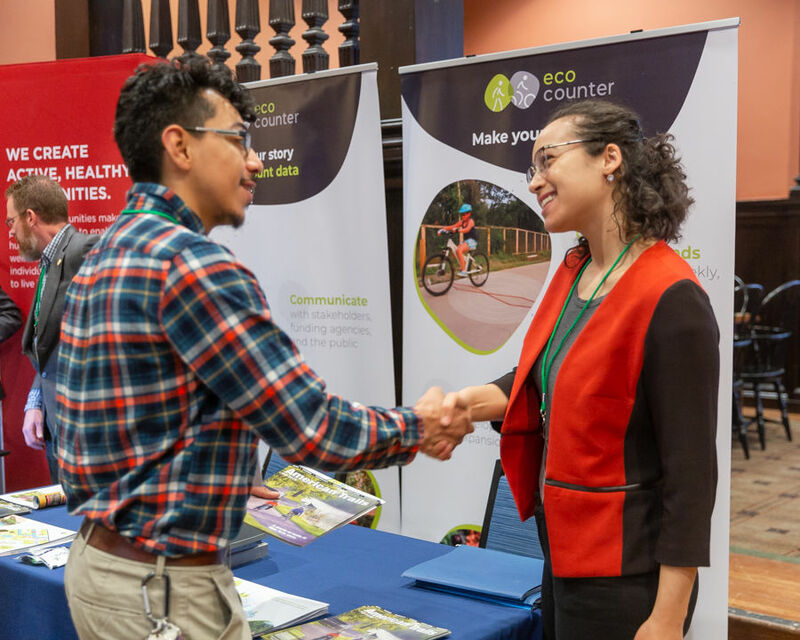 We appreciate the support of our Summit partner organizations and sponsors, including our major Summit sponsors William Penn Foundation, GSK, and NV5 along with AARP of Pennsylvania, EConsult Solutions Inc., Langsam Stevens Silver & Hollaender, Eco Counter, Langan, Toole Design, Alta Planning & Design, DVRPC, JBI Bike, and League of American Bicyclists. 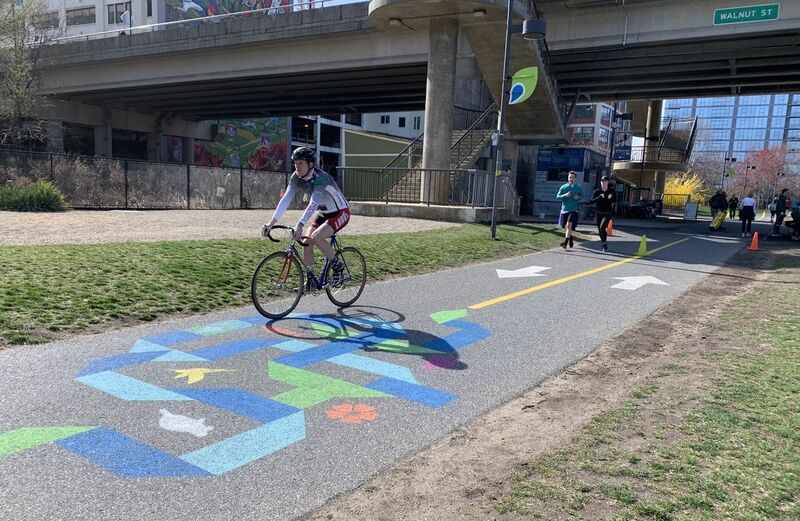 Cyclists and runners pass a chalk-art mural that artist William Woodsey created for the East Coast Greenway along the Schuylkill Banks trail in time for the Summit. The art, including the Greenway's logo, is also visible from above on the Walnut Street bridge. Executive Director Dennis Markatos-Soriano welcome attendees Thursday night at Convene in Cira Centre. Angela Foreshaw-Rouse, manager of state operations and community outreach for AARP Pennsylvania, welcomes attendees on Friday morning. "Welcome to the City of Brotherly Love AND Sisterly Affection," she told the crowd. Mitch Silver, New York City parks commissioner, chats with Niles Barnes, Greenway deputy director. 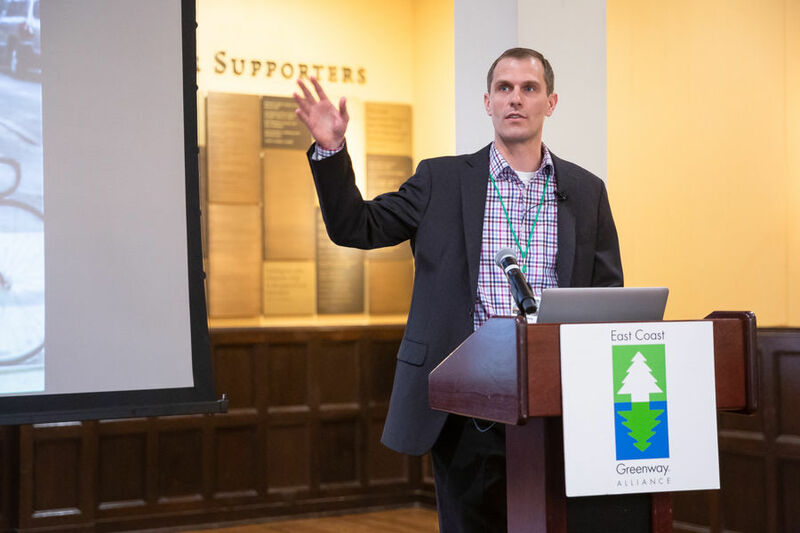 Matt Ludwig, an NV5 engineer and planner, introduces the regional impact report, "Investing in Our Future," that he and his team prepared for the East Coast Greenway. Katie Harris, Capital Trails Coalition coordinator at Washington Area Bicyclist Association, peruses the new impact report. 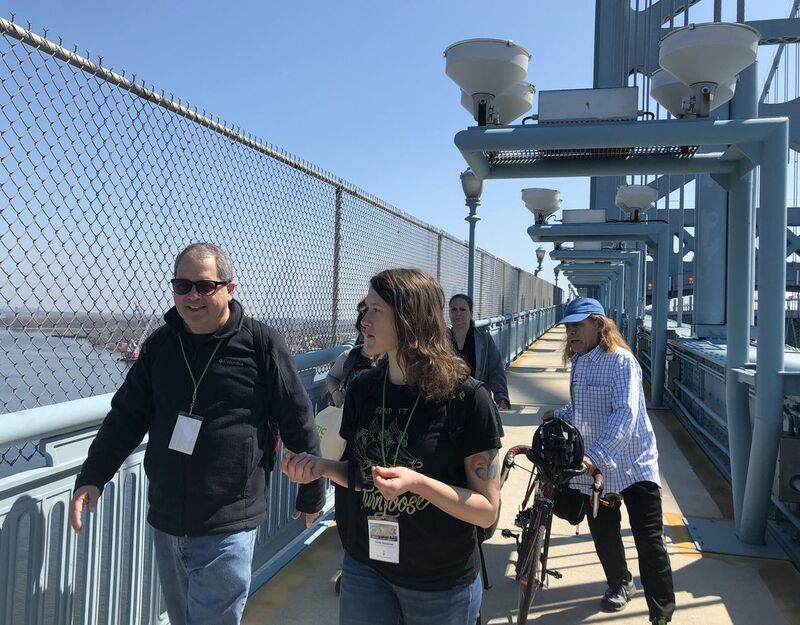 John Boyle, research director for Bicycle Coalition of Greater Philadelphia, and Sonia Szczesna, South Jersey program coordinator for the Tri-State Transportation Campaign, led a dozen walkers from the Camden Waterfront across the Ben Franklin Bridge to Philadelphia on Saturday morning. 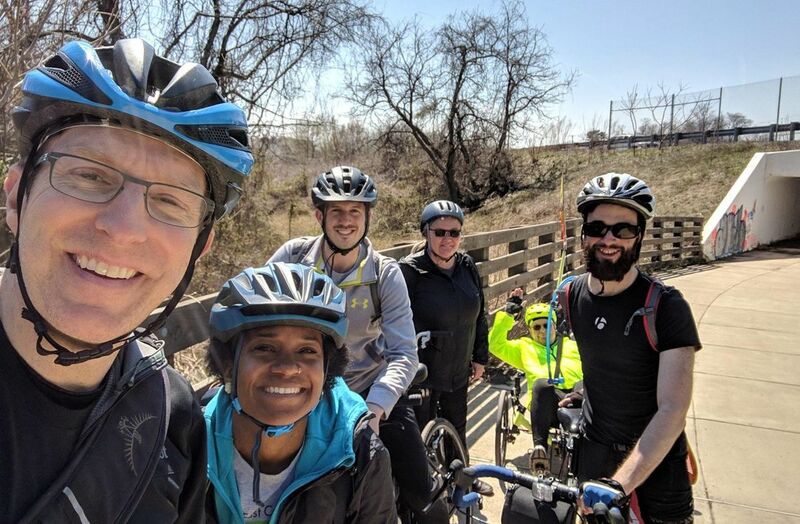 A group of cyclists rode a SEPTA train to Bucks County and biked back on the D&L Trail on Saturday. They were led by Nate Dorfman (right), trails coordinator at Pennsylvania Environmental Council, and included Devin Cowens (center), our summit and events specialist. 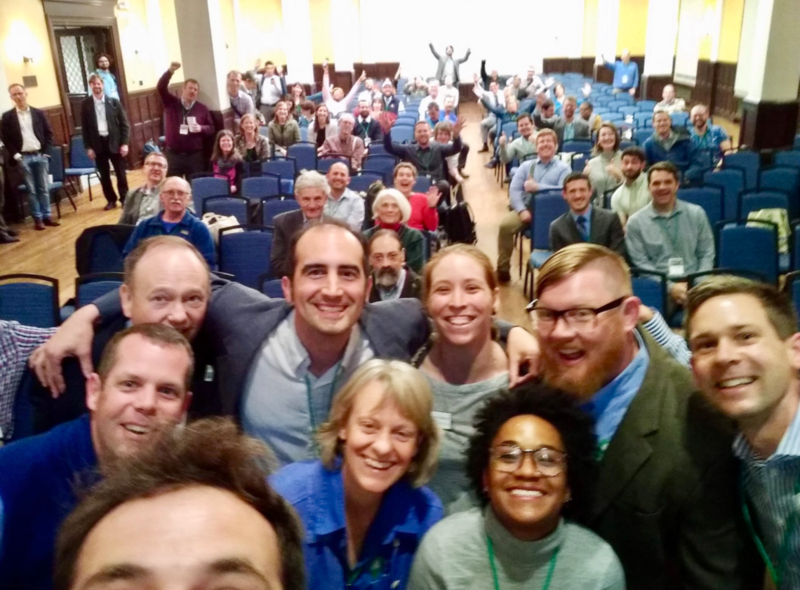 We are family: East Coast Greenway staff and remaining Summit attendees wrap up the first Mid-Atlantic Greenways & Trails Summit with a group selfie. Too bad we didn't give Daniel a selfie stick. 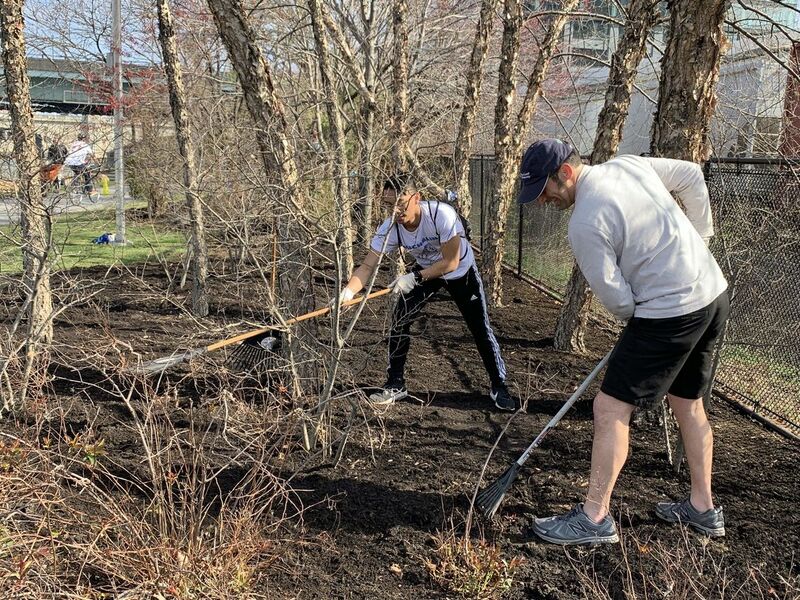 Executive Director Dennis Markatos-Soriano rakes new mulch during the Schuylkill Banks Philly Spring Cleanup on Saturday morning.